... just to have Gattuso as our manager? Give Conte a blank cheque and bring him in immediately. Explain why Leonardo is a worldclass SD. That's the thing. A lot of these players looked good at their prior club but we seem to ruin players. Bonucci last year, Higuain this year. Then you have all the others too. Thats because we surround them with to much mediocre players so their level competition and sharpness drop. Milan is a team in philosophy constructed to have the top players nothing else. The fan base is to large for mediocre players they cant handle the pressure. - We have a worldclass SD in Leonardo. Or why Higuain is a world class forward anymore. Both much more to blame for this performance than Gattuso. Higuain is a world-class striker, no doubt. Even Messi would look like Borini in Gattuso's set-up, which isolates the attacking players. So by that logic Borini would look like Messi if Valverde was manager at Milan? Messi would kill Fiorentina. Lol he doesn’t rely on support like Higuain who cries for every missed pass, he creates his own and creates for others. 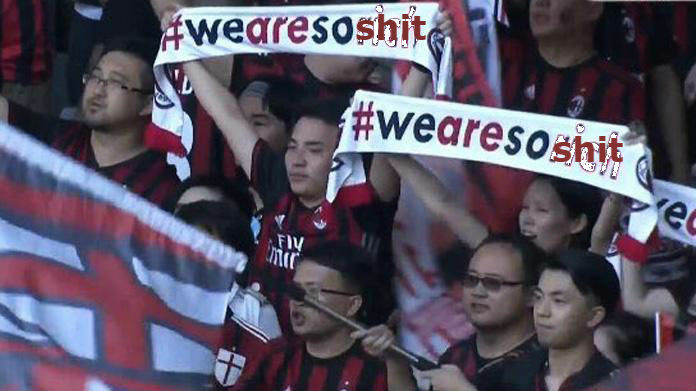 Breaking: Milan fans spotted around San Siro after the game contemplating the team after the last 4 matches.